In recent headlines, stories emerged that some Facebook engineers are living out of their cars in order to continue working for the tech leader. This prompted the question, can you afford to live where you work? In 2016, the site SmartAsset.com found that you'd need to make at least $216,129 a year to make the rent on a two-bedroom apartment. While tech employees of Fortune 500 companies like Facebook make an average of over $100,000 a year, they are facing living cost that rank among the most expensive in the world. Employees have even approached CEO Mark Zuckerberg on how he can subsidize housing for those who are struggling. The job boom that's made San Francisco one of the most expensive places to live in the U.S. is starting to slow down as it becomes too pricey for the workers. 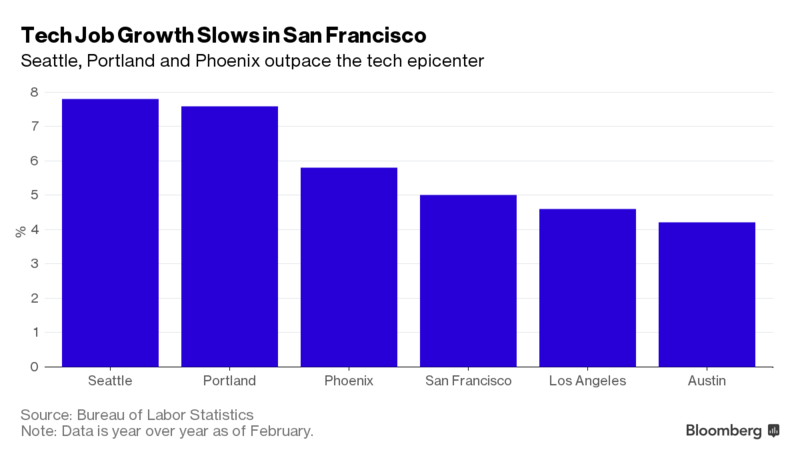 With the Silicon Valley Exodus in full effect, where are tech workers looking to relocate? New York, Austin, Seattle, and Atlanta are the most common but places like Durham, Salt Like City and Baltimore are looking more attractive due to affordability. We've compiled a 20-city comparison of average tech salary side-by-side with average rent-the results are eye-opening. Despite a $20K pay gap on the front end between San Francisco ($113,000) and San Diego ($93,000), their adjusted salary is nearly the same. 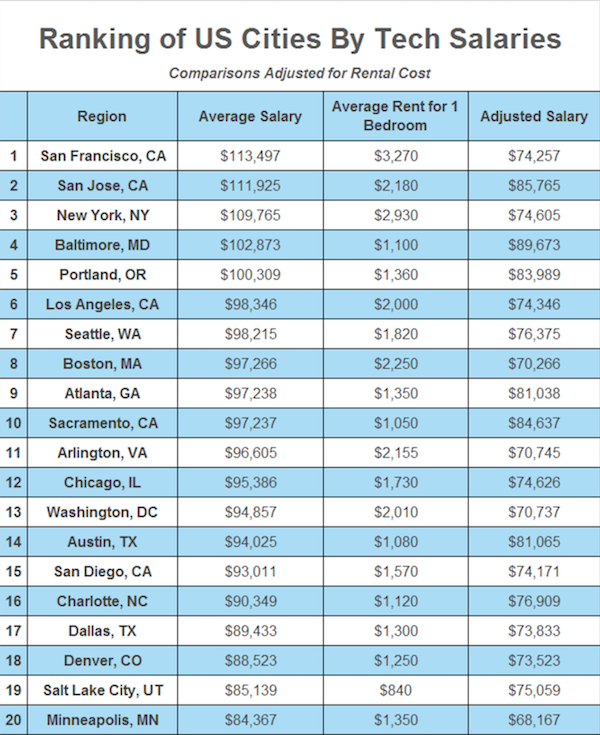 As another point of comparison, San Jose, Sacramento, and Baltimore-albeit less cosmopolitan-can provide nearly $10,000 more in adjusted salary. According to Indeed salary data broken down by roles, app developers in San Francisco on average make around $108,000 a year, but after paying out $3,270 in rent each month they are left with much less. In Austin by contrast, app developers earn "only" $87,700 a year -that's more than $20,000 less than in San Francisco - but their rents are also lower. In fact, the median rent of $1,693 a month will only eat up 23% of an Austin app developer's income. Rental data cited from zumper.com. Numbers based on average cost per month for a one-bedroom apartment.